Far right-wingers are obsessed with freedom of speech, yet try to stifle dissent against their ideas by labelling criticism as 'political correctness' or 'intellectualism'. Yes ... one can apparently have too much knowledge and applying or discussing said knowledge, constitutes intellectualism. If political correctness is the trait of the left, then anti-intellectualism is the trait of the right. Try presenting facts to some of these right-wingers and they'll come back with witty retorts, such as 'you don't understand the real world', or accusing their adversary of being a traitor for daring to question their opinions or ideologies. But apparently it's ok to bust out Nazi symbols and tattoos, even though Hitler was a enemy number one back in the day. Hmm ... who's a little traitor then? It's one thing to have an opinion, but quite another to confuse that opinion with fact. It isn't 'politically correct' to call out lies. It is kind of the astute thing to do. Sadly, a number of people's opinions are founded in falsehoods and misinformation. It also isn't being 'politically correct' to disagree with someone's opinion. One of the most incredible explanations people gave for voting for Donald Trump, was that they were sick of being labelled racist, homophobic, Islamophobic, misogynistic, xenophobic and so on by the 'politically correct, leftist, elites'. Apparently, this is a good reason to vote for a racist, homophobic, Islamophobic, misogynistic xenophobe. If people don't want to be labelled bigots, white supremacists, neo-Nazis, then don't hang out with bigots, white supremacists and neo-Nazis; don't espouse and champion the same ideas as bigots, white supremacists and neo-Nazis. The right accuses the left of being sensitive about political correctness, but then gets all touchy about being called out for their behaviour. Why shouldn't bigotry be called out when we see it. Particularly, when it is dressed up as truth. Even worse when so-called Christians buy into the same hate-speech and fear-fuelled rhetoric as the right-wing extremists. Hilary Clinton claimed that 'you could put half of Trump’s supporters into what I call the basket of deplorables. Right? The racist, sexist, homophobic, xenophobic, Islamophobic – you name it. And unfortunately, there are people like that. And he has lifted them up'(1). Trump's followers took this criticism as a badge of honour, even printing t-shirts and stickers boasting of their deplorableness. Rather than being appalled by bigotry, they wallowed in it and gloated about it. Challenging bigotry and hate-speech isn't being 'politically correct', it is the right thing to do. Racism, and for that matter, Islamophobia, xenophobia and misogyny, are based on one group of people believing they are superior to another. Why shouldn't this be challenged? Particularly, when there is context, history and straight out facts that show that there are no grounds to support this bigotry, and if anything, a reason for people to be a little more self-reflective, to look at the plank in their own eye before picking on the speck in the eye of others. While many people who oppose marriage equality may not have an irrational fear of homosexuality, they do have an aversion to it. (Aversion meaning to have a strong dislike of something). However, some also do have an irrational fear of homosexuality and will go to great lengths to demonstrate this. For instance, they'll argue that marriage equality will lead to people marrying their dogs (who can forget Australian Senator Cory Bernardi's multiple claims along these lines which were defended and repeated by many evangelical Christians). That sort of aversion, that sort of fear-mongering IS a phobia ... homophobia. As for Islamophobia, many people do have an irrational fear of Islam. However, the fear is often based on misunderstanding or generalisations. There is no Islamification of the West. Terrorism isn't the modus operandi of Muslims. In fact, most attacks on US soil have been caused by white supremacists(2). For that matter, much of the killing in the Middle East has been caused by the war on terror led by the United States. Calls to ban the burqa, halal and mosques represents a severe aversion to Islam and is based on irrational fear and, for some, blatant hatred. It IS a phobia ... Islamophobia. And then of course, there is xenophobia: the fear or aversion to foreigners. Given that the common denominator of far-right groups is anti-immigration, anti-refugee and anti-foreigner positions, labelling the far-right xenophobic is self-evident. These are phobias, no matter how much denial and anti-intellectualism the right wishes to hide behind. Simply saying that one isn't afraid of homosexuals or foreigners or Muslims while opposing their very existence, their culture, their lifestyles, doesn't mean that one doesn't have a phobia. Aversion is as much a part of phobias as fear is. By denying the facts and opposing intellectual discussion, the right is indulging in their own form of political correctness. One in which criticism of the right-wing is practically prohibited and the right is sold a message that they are the victims. This victim mentality is driving them to seek alternative parties and for many, driving them to embrace far-right wing politics, whose messages are based more on fantasy and fear-mongering than fact. This victim mindset motivates the herd mentality of the right-wing in which facts are meaningless and defending some arbitary and imaginary line in the sand is paramount. Establishing this arbitrary line in the sand against an imaginary enemy facilitates white supremacy and even religious exclusivity, because after all, Christ is a white, pro-war, gun-toting, capitalist in the minds of many who clearly haven't understood the bible. This mindset is not only used to portray the right-wing as victims, but to shame and blame the real victims; those who have suffered exploitation, persecution, abuse and violence at the hands of their white overlords who are in denial about the harm they cause to others. Civil liberties were established to ensure that all people are treated with the same respect as each other and given the same opportunities in life; particularly that one group of people is not denied opportunities that others have. Somehow the far-right has concluded that equal rights are an attack on their freedoms. Just because someone is given the same rights as you, does not mean that you're being persecuted. Freedom of religion and Equal Employment Opportunity for example, are not persecuting Christians and white people. They just mean that non-Christians can worship how they want and marginalised groups are not excluded from the same employment or education opportunities that the non-marginalised take for granted. Another of the excuses for the right wing voting for Trump was that they felt screwed over by the big-end of town lobbyists who have manipulated government for their own benefit. So they countered this by electing a big-end of town lobbyist to lead the government. Yeah. Great thinking. What could possibly go wrong? This reason is closely linked to another one, in that right-wingers feel marginalised by 'elites' who aren't listening to their concerns. Yeah ... Elites. About that. The right-wing elected a billionaire who was born with a silver spoon in his mouth! Because. they. don't. like. elites! Think about that. Take all the time you need! Apparently this particular billionaire is a 'man of the people'! If you believe that, I have a plot of rainforest on the moon to sell you. Remember the anti-intellectualism position of the right? This is where it all falls down. People aren't analysing or scrutinising the claims they hear. Instead, if the message matches their bigotry it is accepted without question. The truly unbelievable aspect of Trump followers is that they sincerely believe that Trump speaks the truth and isn't swayed by political correctness. Rather than analysing the criticism of Trump and his rhetoric, his followers hunkered down and took all criticism as a personal affront, as a direct attack by the 'politically correct' on their freedoms. So what that Trump's truthfulness was tracking at much less than 10%. His followers just refused to believe it. No questions. No analysis. No self-reflection. Just blind refusal to believe. It was everyone else's fault that their fallacies were being questioned. It wasn't Trump who lied, but the media and the leftist elites and their politically correct agenda ... according to his supporters. There was no concept that many of their beliefs were based on fallacies. They were like sheep being led to the slaughter by a wolf because of their anti-intellectual, victim mentality in which it is everyone else's fault but their own. Trump and his supporters accused Hilary Clinton of constantly lying during the 2016 election campaign, while establishing Trump as the bastion of truth. Yet, the truth shows the exact opposite. The fact-checking website, Politifact, identified that 72% of Clinton's statements were true, whereas only 14% of Trump's were true(4). Just like any voting bloc, Trump's supporters were a mix of educated and the not so educated. However, in this age of information what excuse does anyone have for believing the garbage of Trump or the right-wing parties. What excuse does anyone have for bigotry and ignorance in an age when access to information is at unprecedented levels, meaning that we can all gain a better understanding of others and, for that matter, of our own beliefs and their foundations. 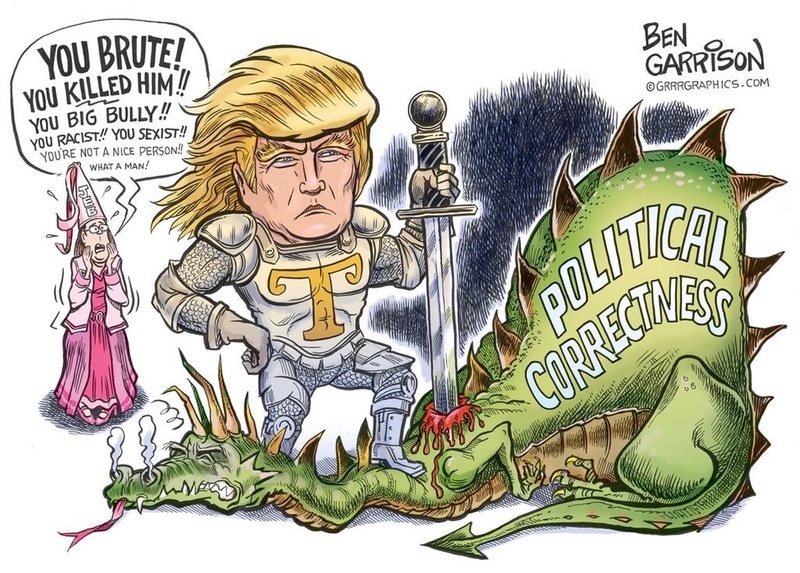 The only reason to argue against 'political correctness' is in order to defend the right to be a bigot. But, hey, as Australia's Attorney-General, George Brandis once stated, 'everyone has the right to be a bigot'. Indeed they do. And everyone else has the right to challenge said bigotry. So what is 'political correctness' about? It's kind of a vague catch-all term used by the right to shut down any argument or position that they disagree with. Often what they are arguing against are positions that suggest all peoples should be treated with respect and dignity; that we treat others as we would like to be treated. Essentially, the right is arguing in favour of disrespecting and abusing others. Funnily enough, these anti-intellectuals like to quote the respected civil libertarian and philosopher, Voltaire, when he said, 'To learn who rules over you, simply find out who are you are not allowed to criticise'. Clearly, we are not allowed to criticise the right because that will be political correctness gone mad ... and guess who just won the election, who will be ruling over us? These anti-elites believe that political correctness demonstrates the intolerance of the left who believe that they are tolerant ones. Freedom of speech cuts both ways. People are free to speak their minds, which includes the criticism of others (otherwise, the right would have no right to criticise the left and vice versa). But typical of the right's victim mentality, any criticism or challenge of their bigotry and anti-intellectualism is interpreted as intolerance. At the risk of being accused of intellectualism, I'd like to quote philosopher Karl Popper who wrote about the paradox of tolerance, concluding that for the world to be a truly tolerant place, 'we should therefore claim, in the name of tolerance, the right not to tolerate the intolerant'. While the right-wing bangs on about freedom of speech, they are really just wanting approval to deny freedom to others, such as the freedom for people to marry whomever they want regardless of gender, the freedom to have an abortion, the freedom to worship at a mosque, the freedom to claim asylum based on the Refugee Convention, the freedom to protest. Forget 'political correctness' as being a threat to our freedoms. We are in a post-truth age, where truth is less important than stoking people's fears and appealing to their emotions. It is this that feeds xenophobia and bigotry. And no amount of labelling critics as the leftist elite changes the fact that these fears are rooted in falsehoods purely for the political expediency and popularity or right-wing politicians. The Far-Right is 'factophobic': they have an aversion to the truth and fear the facts that would destroy their already weak arguments and beliefs. No amount of argument will change the minds of those who refuse to see. As non-conformist minister, Matthew Henry, once stated, 'None so deaf as those that will not hear. None so blind as those that will not see'. However, this is no reason to stand idly by and not challenge bigotry and anti-intellectualism. After all, if the right-wing is so big on freedom of speech, they would defend to their deaths the left's right to speak up whether they agree with our views or not. This current swing to the far-right goes beyond freedom of speech. It is blatantly racist, xenophobic, homophobic, mysognistic, Islamophobic. It is a movement of hate and extremism. To sanitise this the far-right invented a more family-friendly, dare we say it, a more politically correct way to describe themselves: Alt Right. The Alternative-Right. Essentially rejecting traditional conservatism and replacing it with an ill-defined ideology that has at its heart, white nationalism(6). Alt Right is just a rebranding to make themselves more appealing to the masses. To term themselves Neo-Nazi is a little confronting for many people, however, that is what the Alt Right is. Just as Hitler hijacked the term 'socialist' in order to trick the left-wing into attending his meetings, Neo-Nazis are utilising the term 'Alt Right' to trick the right-wing into believing they are a legitimate political cause. They aren't. They are Nazis, white nationalists, white supremacists. Obviously, not everyone on the right wing agrees with these extremists and have moved to distance themselves. But those who remained and voted for Trump and his policies of white nationalism and supremacy, are rightfully labelled as Neo-Nazis. As George Orwell stated, 'A people that elect corrupt politicians, imposters, thieves and traitors are not victims ... but accomplices'. The only way to overcome bigotry is for bigots to have a revelation of the deplorable manner in which they speak about and treat others. It is only when people have this revelation that they will understand how unacceptable it is to hate others because of their race, gender, religion, sexual preferences or other identifiers. Children's cartoonist and writer, Dr Seuss, opposed racism and fascism. He was an active political commentator and in one of his cartoons he illustrates the necessary defogging of the bigoted mind. The left isn't trying to shut down freedom of speech, it is trying to explain that one group of people isn't superior to another and that intolerance of other people is often based on falsehoods and misconceptions. 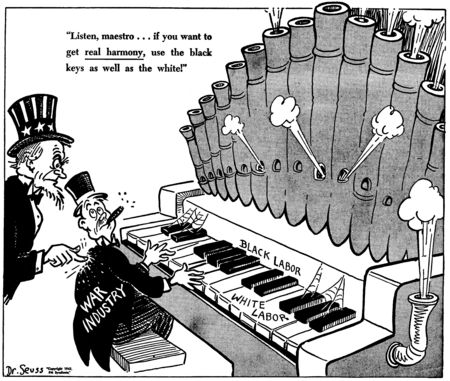 Dr Seuss published numerous cartoons condemning racism and promoting harmony. The world will be a better place when all races and peoples have respect for each other and work together. 1. The Guardian, Ben Jacobs, Hillary Clinton regrets 'basket of deplorables' remark as Trump attacks, 11 September 2016, https://www.theguardian.com/us-news/2016/sep/10/hillary-clinton-basket-of-deplorables-donald-trump. Accessed 4 December 2016. 2. The Washington Post, Maggie Ybarra, Majority of fatal attacks on U.S. soil carried out by white supremacists, not terrorists, 24 June 2015, http://www.washingtontimes.com/news/2015/jun/24/majority-of-fatal-attacks-on-us-soil-carried-out-b. Accessed 4 December 2016. 3. Esquire, Jack Holmes, A Trump Surrogate Drops the Mic: 'There's No Such Thing as Facts', 1 December 2016, http://www.esquire.com/news-politics/videos/a51152/trump-surrogate-no-such-thing-as-facts/. Accessed 4 December 2016. 4. Politifact, Comparing Hillary Clinton, Donald Trump on the Truth-O-Meter, http://www.politifact.com/truth-o-meter/lists/people/comparing-hillary-clinton-donald-trump-truth-o-met. Accessed 4 December 2016. 5. 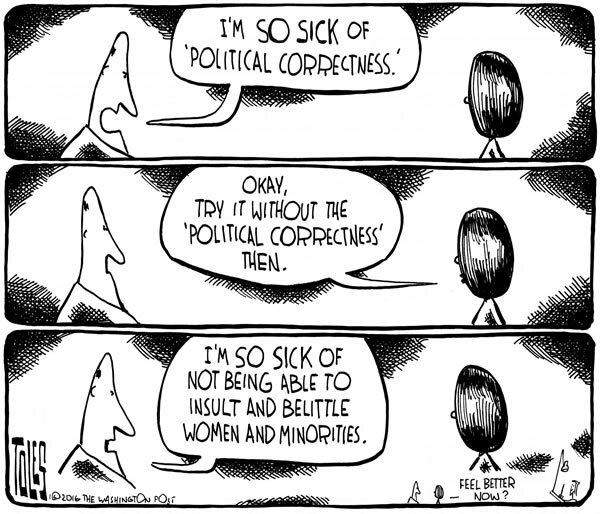 The Washington Post, Tome Toles, What does it actually mean when somebody complains about political correctness, 5 January 2016, https://www.washingtonpost.com/news/opinions/wp/2016/01/05/what-does-it-actually-mean-when-somebody-complains-about-political-correctness. Accessed 4 December 2016. 6. The Nation, Ian Allen, 'Alt-Right' Is Not a Thing. It's White Supremacy, 23 November 2016, https://www.thenation.com/article/alt-right-is-not-a-thing-its-white-supremacy. Accessed 4 December 2016. 7. 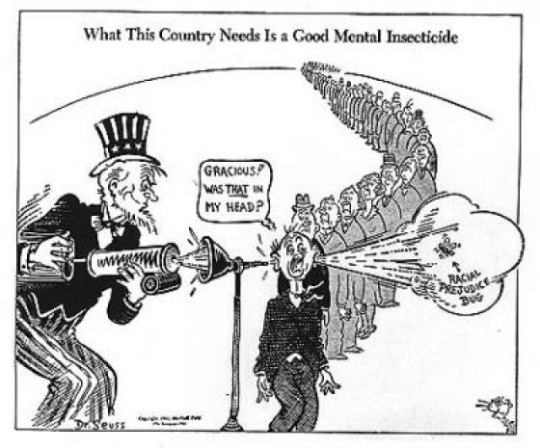 Regents of the University of California San Diego, Dr Seuss Went to War - A Catalog of Political Cartoons, http://library.ucsd.edu/speccoll/dswenttowar/index.html#ark:bb7065726h. Accessed 4 December 2016.